Snake River Farms is now offering large cuts of American Kobe beef allowing consumers to custom cut their own steaks and roasts. Known as “subprimals” within the beef industry, these substantial portions allow foodies and beef aficionados to create an artisan butcher shop in their own kitchens. There are two different items available to match the personal beef preferences of a variety of customers, a Strip Loin and Eye of Ribeye Roll. Each of these subprimals are aged 28 days for excellent flavor and texture, and hand-trimmed by a master butcher to minimize waste making it easy for the most casual chef to cut perfect steaks. The American Kobe Strip Loin is boneless, weighing approximately 16 to 17 pounds, and is the source of New York strip steaks. The New York is one of the most popular steakhouse cuts and is highly prized for its rich marbling and flavor. The Strip Loin has a defined grain that provides a satisfying bite that is the signature of the New York steak. 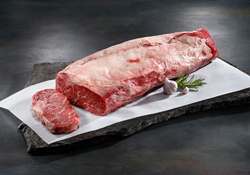 The American Kobe Boneless Eye of Ribeye is a whole ribeye roll weighing approximately 10 pounds and features beautiful marbling and a rich, juicy flavor. These ribeye rolls can be cut into luxurious steaks or prime rib roasts depending on the season or occasion. Snake River Farms American Kobe beef can be purchased online at http://www.snakeriverfarms.com and for more information or to order Snake River Farms products, please visit the website or call 877.736.0193.